Three words that best describe Carlos are: Hardworking, Responsible, Outgoing. Carlos was born and raised in Hollywood, CA. Carlos felt it was time for a change in his professional life and has chosen to follow his passion and pursue a career in cosmetology. Carlos is a graduate of the Aveda Institute. He joined our team in 2014 as a salon assistant, mentoring under Destiny Mendez and Andre Lazaro. As a new talent, Carlos is trained on a vast array of salon specialty services. 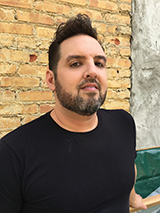 He is no stranger to hard work and believes that continuing education, exceptional customer service, and a committed team will help develop his techniques and skills to become a Master Stylist.